How do you define caregiving? How do you define compassion? How do you define love? I see all that and so much more in my friend Joan Leeney … her expressive face, her rich voice, her warm embrace, and the way she always gazed at her husband, Jim, a stroke survivor who also has multiple sclerosis. No matter what, she gave him everything … a sense of normalcy, a community of friends and fellow survivors and caregivers, and all of her physical and emotional strength to make sure the world did not close its doors on this couple despite the challenges. Joan Leeney opened so many doors and so many hearts and minds because she and Jim were going to enjoy life every day, whether the world was ready or not. I loved Joan because she always made everyone around her feel so good and so alive. And that’s what makes her passing on Friday so hard to grasp, so hard to imagine. Joan never let anything stop her until the very last breath, even when the cancer was destroying her physical body this past year. But it never destroyed her faith and love of life and Jim. She made sure Jim attended Stroke Camp in Elmhurst, IL, in July, even though she had to accompany him in her own wheelchair because of her weakened state, joined by their son and daughter-in-law. As I fought my tears while taking their family photo — because I knew it would be the last time — she once again used her magic to get a smile out of Jim. He did that for her to create beautiful memories and to make me smile. Joan is in heaven now, finally free of the earthly pain, dancing with God and all the angels, because she wasn’t afraid to ask for anything. Just one of many reasons I loved her so much. If you knew Joan, you know what I’m talking about. And if you didn't have the privilege to meet her, I’m sharing this short video of some of my favorite photos I shot of her and her precious Jim … They make me smile and cry, and it's okay to have a lot of both right now. And you wonder why I find being part of Stroke Camp so vital, and why Stroke Camp is so important to so many lives. I love MY survivors and caregivers for giving me inspiration, love, laughter, lessons … and a new reason to wake up every day. This past weekend was one of the best camps I've had the privilege of attending. 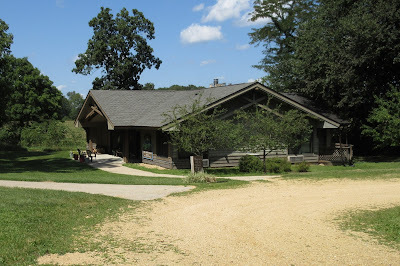 It was held at the Lutheran Outdoors Ministry Camp located near Oregon, Illinois. We've used this camp grounds several times now and it is a terrific place with lots of scenic beauty and wildlife. During morning walks we have spotted deer, turkey, coyote, and many birds. 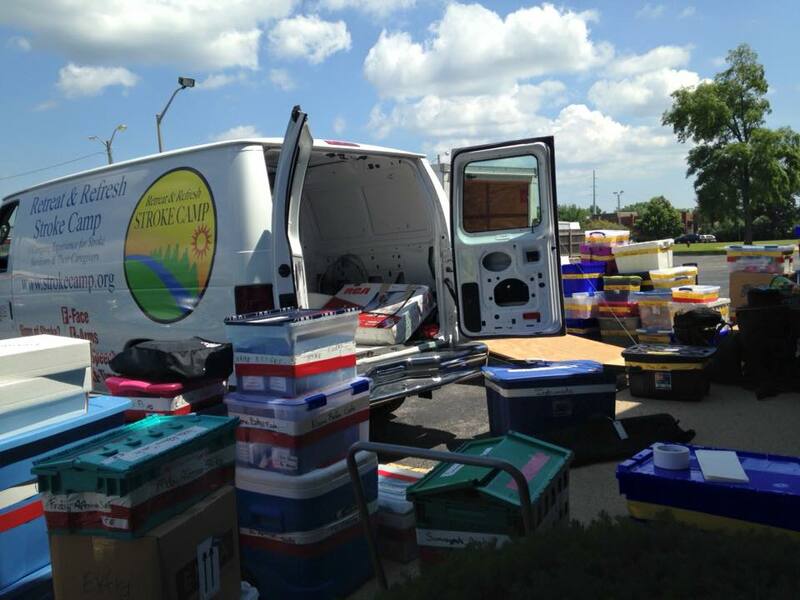 This year we had two camps going on the same weekend so we had to pack both the van and the trailer. 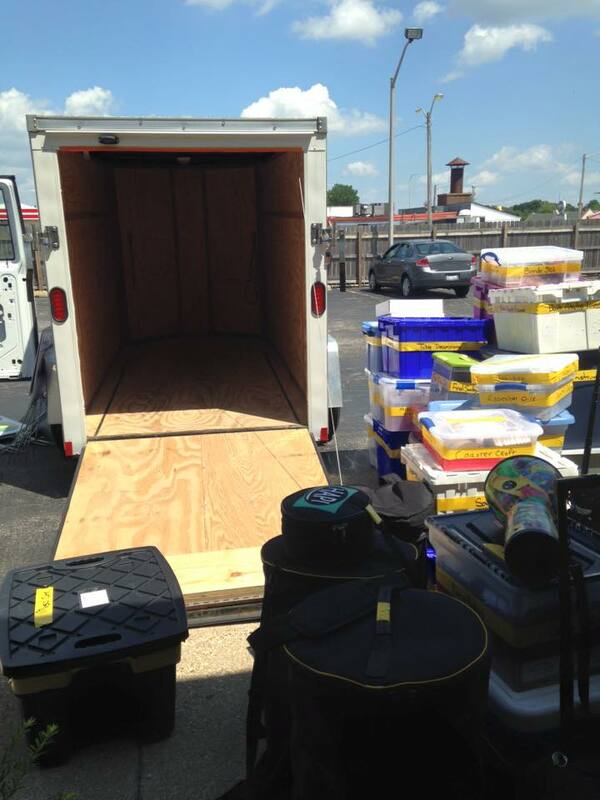 the trailer went to the LOMC camp. There were many repeat campers this year as in the past. More than half had attended more than one camp this year at this location. There were two camps held this year a couple months apart and most of the repeats attended both camps. Now tell me, have you ever seen a better looking bunch of campers, ever?! We were housed comfortably in three beautiful locations. Here is one of them. Here's a look at some of the things we do at camp. No she's not injured. She's just letting the warm soothing wax do its magic. A volunteer or staff member is always on-site to help the stroke survivor enjoy the moment. This year was unique in that we were able to help our stroke survivors and their caregivers enjoy the zip-line that the LOMC camp has on-site. I wish you could have seen the excitement of the survivors as they did this. Plenty of assistance was available to help them enjoy this. Survivors who were able to at least stand alone, even without the use of their hands were able to experience this. We also do crafts, entertain our campers with skits, and always have a special, fun filled Saturday evening program for your enjoyment. You never know what to expect at our camps because we strive to make them fun, entertaining, educational, comfortable, well fed, and therapeutic. Please come join us some time. I haven't done this kind of thing before but this week I'm just presenting a link to a news report from KIMT TV in Rochester, Minnesota. This is not the first time we were featured in an uplifting news report but it is the first time we conducted a stroke camp in Minnesota and as usual with our other camps it was very well attended, as you will see. I'm sure we'll be invited back next year and this one will be added to the 20+ camps (and growing) we are conducting all over the country. 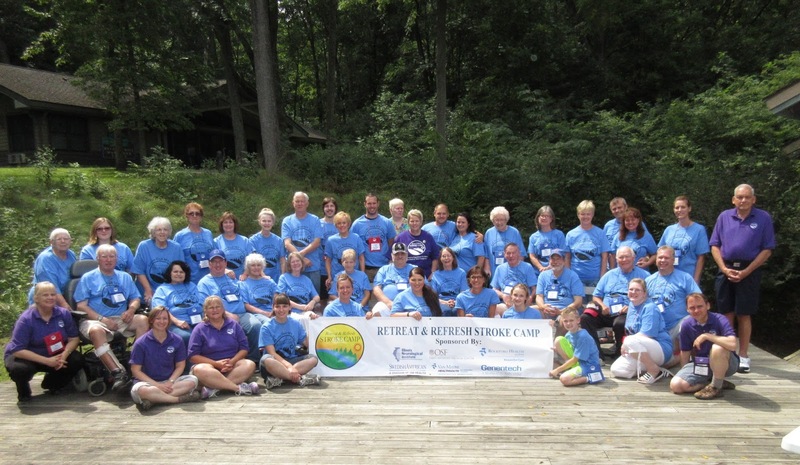 Strike Out Stroke was born out of the non-profit organization, Retreat and Refresh Stroke Camp. Stroke Camps began 10 years ago by Marylee Nunley and her husband John, a stroke survivor, who recognized the need for a weekend of relaxation, pampering, support, and camaraderie for stroke survivors, their families, and their care-givers. Since Stroke Camps humble beginning 10 years ago, it has grown to reach 12 states and continues to grow every camp season. Through their work, Marylee and Larry Schaer, another Camp founder, found there was a great need in stroke education across the country, and thus the idea for Strike Out Stroke was born five years ago. The simple mission of Strike Out Stroke is to spread the F.A.S.T message across the country and greatly increase the number of stroke survivors who get to the hospital in time to get life-saving treatment. Strike Out Stroke continues to grow every summer, reaching over 20 professional baseball markets along with planning and creating new stroke awareness campaign across the country. Stroke is an emergency, a brain attack cutting off vital blood flow and oxygen to the brain, and 800,000 strokes will occur in the United States this year. It is the number one cause of adult disability and the fourth leading cause of death. Stroke can happen to young and old. We were honored to have stroke survivors from our community join us tonight. Tom Pfeifer, now 71, was 58 at the time of his stroke. At the time, he was the director of Wisconsin Workforce Development. Unable to walk or talk after his stroke, with great determination and perseverance, Tom is now living independently. He is a huge sports fan and was honored to be on the field with his beloved Brew Crew. Michelle Nelson was only 33 when she was struck by the first of her three strokes. Unable to return to her job in the paper mills following these devastating strokes, Michelle visits rehabilitation centers regularly to help other sin recovery and brings her dogs along to share the joy they bring nursing home residents. Joe Romensco suffered a stroke at age 48. An avid bicyclist, Joe had just completed a 100-mile bike tour when he had his stroke. Following concentrated months of physical, occupational and speech therapy, today Joe is an active volunteer, helping other survivors experience freedom through adapative cycling. 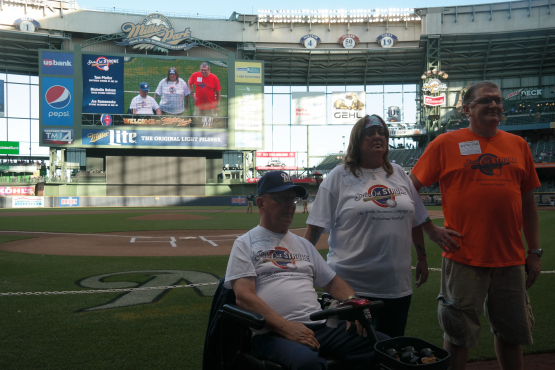 Finally, Alan Schoenwetter, a stroke survivor who has overcome complete paralysis of his left side, was on hand to throw out tonight’s ceremonial first pitch as a representative of Strike Out Stroke. The following article was first published on the Care Partners Resource web site (carepartnersresource.com) in December 2009. 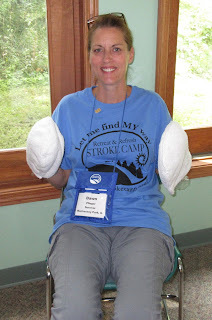 The author, Lori, is also the owner of the web site and a volunteer at our Colorado Stroke Camp. 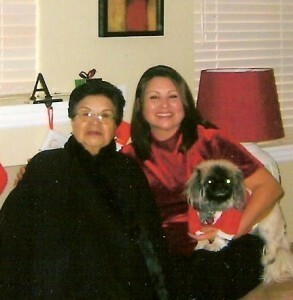 I encourage you to visit her site for excellent articles and help on caregiving. As a care partner it is easy to get wrapped up in the idea that you have to be perfect, a saint if you will. We are trying to be all things to all people and lest not forget those around us reminding us we are doing something most people could not or would not ever do. For this reason it is easy to get caught up in the idea that we should not experience human frustrations or emotions. There can become a point when those frustrations can be taken too far and in those cases I urge a caregiver to reach out and seek help. This article is about trespasses that cause mostly harm to the caregiver not our loved one. Moments of shortness of patience, a harsh word or even a selfish thought that we carry deep in our soul reminding us we are not perfect. I began my journey for sainthood long before I became a care partner. From an early age it was important for me to be the perfect daughter, the best wife and of course the most patient and loving mom. So when my mother survived her stroke and I made the decision to become her live in caregiver I had the same expectation, PERFECTION. One might think that it would be logical to allow myself a little slack since my career had been in the mortgage industry not the medical profession and mother needed constant care because of the effects from her stroke or the fact that I had been out of my parent’s home for 26 years and moving home was a huge adjustment. But care giving leaves no time for slack, too much to learn, too much to do and too many opportunities to be less than perfect. I care gave and care partnered my mother for 8 years and during that time and the four months since her death I am bothered by my own trespasses. The times my patience ran out and I spoke to her in a less than loving voice or when I would get busy doing things around the house and forget to make sure she was fed on time. My biggest regrets are the times I would cut her off when she was trying to tell me something. My mom was unable to speak in sentences after her stroke so we spent a lot of time figuring out what she was trying to say. She said “do do do” thinking she was saying words. During the first few months following her stroke we would spend up to 45 minutes playing 500 questions only to discover she wanted a piece of lint picked up off the floor. After a while it all became too much and I began cutting her short. I would say “okay Mom is there pain, are you hungry? Okay forget it, we’ll figure it out later, here just watch T.V.” I think of how difficult it must have been for her going from the matriarch of our family where everything she said was heard with respect to being cut short when she was just trying to make small talk. I feel angry at myself for my lack of patience. I wish that I had been able to settle into my role as a care partner as gracefully as mom was able to adjust to her role as a stroke survivor. My trespasses as a caregiver were secrets I had carried silently deep inside fearing judgment. I am telling my secrets in the hope that other care partners and caregivers will see that they are not alone. We are humans not saints and as such we are subject to moments of stress and feelings of being overwhelmed. Acknowledge your limits, ask for help and take a moment to breath. You will be a better care partner by loving yourself without judgment, guilt benefits no one so forgive your trespasses and move forward.